Hi Aspirants, here are some useful GK Quiz Questions for SSC CGL Exam 2016 which is going on. Click the ‘START QUIZ’ button to attempt the quiz online with multiple choice options. 1. Japanese Temple & Peace Pagoda is located where in India? 2. The Hindustan Shipyard Limited is located at? 3. Which of the following is the folk dance of Odissa and Andhra Pradesh? 4. Heat energy from the sun reaches the Earth through a heat transfer process known as? 5. Which space shuttle carried Sunita Williams beyond the Earth? 6. India shares longest International border with which country? 7. World Economic Outlook is published by? 8. Which of the following states of India became the first carbon free state? 9. Which country is the most educated country of the world? 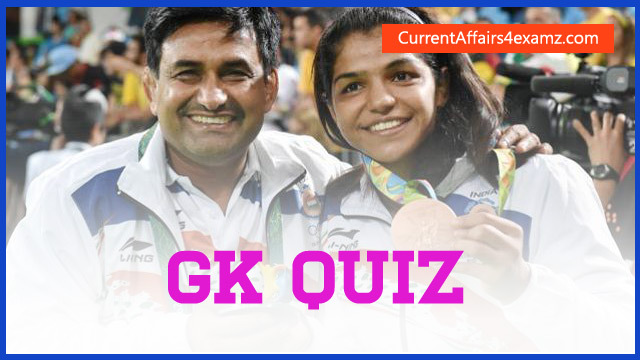 10. Who was India's flag bearer at the closing ceremony at Rio Olympics 2016?